Got 30 minutes? You’ll flip over this easy, Thai-inspired meal-in-a-bowl. It’s fresh, vibrant, healthy and super delicious! My kids laugh because they know that when I get my mind on perfecting a recipe I’m relentless, till my goal is accomplished. When they were growing up, that might mean the family ate the same thing for dinner several (sometimes many) nights in a row until I was satisfied. These 30 Minute Thai Basil Beef Bowls are a perfect example of my relentless-ness. Cait and Nick (our grown children) also say they learned that they’d probably never have it again after that. Once the mission was accomplished, I’d be onto something new. Wanna know the really bad part? If, a few month later, they would say, “Hey mom, remember that ______ you made for us a while back? Could you make it again?”, I wouldn’t have a clue as far as how to repeat it! The problem was, I rarely wrote the ingredients down. I haven’t changed much over the years, except now I have a food blog. Because of you, I’m even more determined to get each recipe just “right”. And these days, I carefully measure and document everything! The first time I served these Thai Basil Beef Bowls, it was just Scott and I for dinner. After taking the first bite, I said, “Wow, I believe this one’s perfect, right out of the gate!” Scott was busy enjoying his meal, but after a minute or two, he looked up. “I wouldn’t mind, if you tested this recipe for the next week or so. It might need more tweaking and testing.”, he said, with a sheepish grin on his face. I had to laugh, because I knew exactly what he meant. He loved it and didn’t want the recipe slipping into the Café archives before he had a chance to enjoy it a few more times. I went along with him and pretended that he was right, as I also loved these delicious, decently-healthy rice bowls. I “tested” them out for several others to0, and the consensus was unanimous – definitely a winner! Basil Beef is a dish you’ll find in many Thai restaurants. They also often have a chicken and/or shrimp version. Thai Basil beef is usually prepared with some type of beef steak, but I chose to create an easy, quick rendition with ground beef. Although I didn’t follow this recipe, I was inspired by the use of soy sauce and sweet chili sauce for the main ingredients. I love how the combination is a really easy way to add sweet, spicy and salty, with only two ingredients! In addition, there’s fresh ginger, garlic and lemongrass along with a splash of fish sauce, all combining for a super delicious flavor profile. Oh, and lots of fresh basil. Actually two layers of the vibrantly flavored green leaves. Half of the sliced basil is added while the beef mixture is still being cooked, so it wilts and melds with the other ingredients. The other half is added right before serving, so it stays nice and green and adds a fabulous fresh flavor. I like to use a handful of small basil leaves for garnish also, if I have them, but it’s not necessary. The other ingredients are your choice – whatever looks fresh at the market. I used thinly sliced seedless cucumber, prepackaged shredded carrots, sugar snap peas and finely sliced red cabbage. Sliced peppers in any hue would also be nice, as would edamame, steamed broccoli, fresh cilantro, green onion, avocado, bean sprouts… See what I mean? The sky really is the limit! I also love adding a small handful of cashews or peanuts on top for a nice crunch. The dressing (or sauce) is my version of Nước chấm which is a traditional Vietnamese dipping sauce – usually a combination of fish sauce, lime juice, sugar, garlic and a bit of heat. I know I’m crossing nationality borders just a bit from Thailand to Vietnam, but the sauce goes so nicely with the beef, adding moisture to everything and another layer of vibrant flavor. I love that it’s a no-fat, low calorie sauce that’s wonderful drizzled over all the components of these Thai Basil Beef Bowls. You’ll need just a few other ingredients on your shopping list. Low sodium soy sauce is important, so the beef doesn’t end up too salty. And don’t skip the fish sauce. It’s one of those ingredients that give this dish lots of authentic, vibrant Thai flavor. Just a warning though, it’s best not to smell it. To be honest, it stinks – but don’t let that deter you. The flavor it adds is nothing like the smell! I really like Red Boat Fish sauce. It’s been rated as the number one fish sauce by Cook’s Illustrated. You can usually find it at special stores like, Whole Foods, Trader Jo’s, Sur La Table and online. So, if you’ve got 30 minutes, that’s all it will take to put together this wonderful dinner. Like Scott, I have a feeling your family/friends will be requesting it again and again! 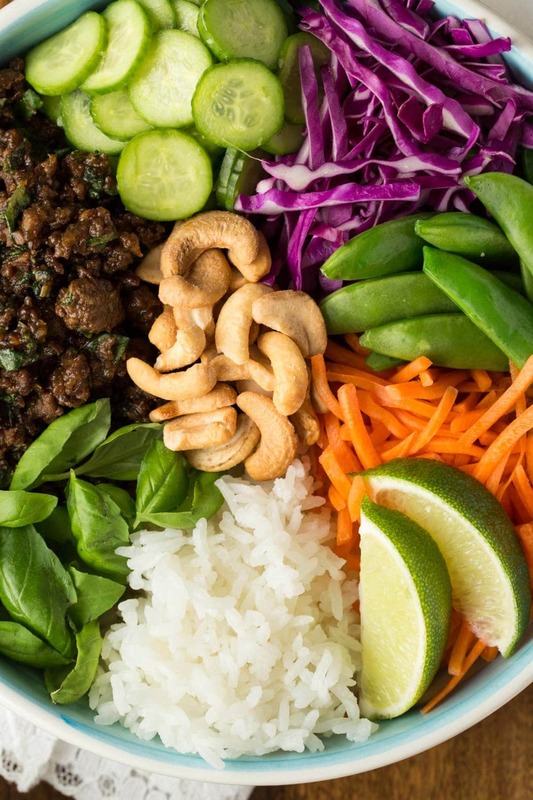 Basil Beef Rice Bowls - an easy, Thai-inspired meal in a bowl that's fresh, vibrant, healthy and super delicious! Combine the garlic, ginger* and lemongrass* in a small bowl. Set aside. Heat coconut oil in a large, tall pot** over high heat until very hot. Add ground beef and break apart with a metal spatula to cover the bottom of the pot. Continue cooking for about 5 minutes or until meat is beginning to brown on the bottom. Turn meat, breaking up again with the metal spatula and redistributing to cover the bottom of the pot. Cook, stirring once or twice until beef is uniformly cooked all over. It won’t be super brown at this point, just nicely cooked through. At first, a lot of moisture will come out of the beef but, as it cooks, the moisture will be reabsorbed. You shouldn’t have much fat in the pan (if you’ve used lean beef) but if there is fat accumulated after meat is cooked, pour it off and discard most of it. Once meat is cooked, lower heat to medium and add chopped onion. Cook for 3-4 minutes, stirring occasionally until onion is softened and becomes translucent. Add the soy sauce, fish sauce and sweet chili sauce to the beef mixture, and cook over medium heat for 3-4 minutes, stirring frequently until meat mixture is a nice golden brown. (This means the sugars from the chili sauce will have caramelized, creating even more deliciousness.) Add 1/2 cup of the finely chopped basil and stir for another 30 seconds or until basil begins to wilt. Remove pot from heat and cover to stay warm. Add the remaining basil and stir to combine just before serving. To make the rice bowls, scoop about 1/2-3/4 cup rice into one side of a bowl. Spread a little of the rice over the bottom of the bowl but keep most of it in a little pile on one side. Add a scoop of beef (about 1/2-3/4 cup) next to the rice and then 1/2 cup size portions of the veggies. (If I'm using sugar snap peas, I like to steam them in the microwave.. I just put them in a microwave-safe bowl with a tablespoon of water and cover the bowl with plastic wrap. Then I cook it on high for 45 seconds, remove from microwave, uncover and cool.) Garnish with cashews and fresh basil leaves. Drizzle with some of the nuoc cham. Serve and enjoy! * Sometimes lemongrass is hard to find. You can find lemongrass pastehowever, in many larger grocery stores (in the produce section), including Super Walmart. It's a good sub and you can keep it in the freezer for a long time. Just thaw slightly before using. They also have ginger in these little tubes. It tastes very fresh and makes meals like this quick and easy. ** You can actually make this in a large sauté pan, but I hate making a big mess on my stovetop. If you use a tall pot, you eliminate most of the spatter that comes from cooking the beef. *** don't skip the fish sauce. It's one of those ingredients that give this dish lots of authentic, vibrant Thai flavor. Just a warning though, it's best not to smell it. To be honest, it stinks - but don't let that deter you! The flavor it adds is nothing like the smell! I really like Red Boat Fish sauce. It's been rated as the number one fish sauce by Cook's Illustrated. You can usually find it at special stores like, Whole Foods, Trader Jo's, Sur La Table and online. A delicious, classic Vietnamese dipping sauce. Combine all ingredients in a medium size bowl. Stir to combine. This looks fabulous and I am on my way to get all the ingredients! My question – what size bowl in ounces is the one with all the goodies so wonderfully displayed? I want the same look for serving and am pondering a purchase of 22-oz bowls but have no idea if this will work. Thank you! MMMMMmmmm, this is my kind of deliciousness, Chris! I can see why Scott wanted to eat it a few more times. I tend to do the same thing that you do – once I create a dish I’m happy with I tend to forget it. Sometimes I’m looking through the archives of my blog and I”m wondering why I don’t cook those dishes that I love so much, lol. This looks delicious. I feel a little dumb though – do you make up a dish for each person? I was thinking of serving this at a luncheon I will be hosting and just want to do it right. Are the vegetables cold and the meat and rice hot. Haven’t eaten much in terms of Thai food so not really familiar with it. Thanks! Very good questions Janice! You can serve it several ways. One way is to pass it around on a large platter (like our photos) with all the components and let the guests serve themselves. Another way is to have all the components in separate bowls and either do buffet style, or pass around each bowl until everyone has had everything. You’re correct, the rice is warm and the meat is too, but they don’t have to be super hot. With separate bowls for each part, you can have different appropriate temps for each. Enjoy!! Thank you so much for this recipe. I made it for lunch last Friday for 5 girlfriends. They absolutely loved it and so did I. I doubled the recipe and was so glad I did because that meant I was able to enjoy it again. Ate the last of it for lunch yesterday and it was just as good. I also made one of the appetizers you have on your site (a goat cheese mousse with smoked salmon on a cracker – they loved that too!) I have made so many of your recipes and am so glad I found your website. THANK YOU!! When I saw the photos of this gorgeous bowl, I knew I would want to try the recipe! Thanks so much for mentioning Red Boat fish sauce. Usually, I can’t use fish sauce due to family gluten and shell fish allergies, but Red Boat is gluten and shell fish free!! The lemon grass paste is new to me also, and I will be looking for it the next time I am at the grocery store. Enjoy it Wendy! Thanks for the tip too! Haha, this is so true! I’m making chicken and wild rice soup again this week so I can get it just right. Your Thai beef bowls are beautiful and I can’t imagine they’re not delicious with a thumbs up from both you and Scott! They are really delicious Liz – and addictive! I love basil minced beef! Your version looks so good. Can’t wait to give it a go! You’ll love it Angie! It’s the perfect blend of sweet and spicy, with lots of healthy stuff in the mix! This looks so yummy! My meat eater husband would LOVE the beef, and he’d actually eat all this minus the sauce (he’s extreeeeemly picky with anything from the water) And just like his veggies plain. But I have a question, do you have a particular rice cooker you like to use to make that delicious sticky rice? I’ve heard Japanese brands are the best. Honestly Therese, I don’t think he has anything to worry about with fish sauce, but it does add an unbelievably delicious flavor to this beef. Haha – I had to laugh because this is how it goes at our house too. My husband calls them “one and done” meaning I make something that was really good and he’s afraid I’ll never make it again. However, some of my favorite recipes show up at our monthly family Sunday dinner with the whole gang. I love this recipe – the beautiful colors, how quick it comes together and it’s all in one bowl! Hope you don’t get too much snow 🙂 We’re supposed to get 3 inches – so not much this time. Oh well – at least we don’t have to shovel! Stay warm! Thanks Tricia! The only problem you may have is making enough! It is so good, everyone keeps coming back for seconds and thirds! Our “snow” was more like three inches of frozen rain topped with a couple of inches of dry snow. Not exactly snow ball or snowman precipitation! Chris, I love meals like this. Simple ingredients with LOTS of flavor. Plus I love mixing my ingredients around…..something different in each bite! I’m glad it was just as you had hoped the first time around! Thanks Anne! It was a winner, right off the bat – so much flavor! It is gorgeous! I must admit that I have never tried fish sauce. When will Scott start posting on his blog? Will it be a photography blog? He’s working on it as we speak Ginny. It will be part of the Café posts and will include gardening, photography, DIY and home automation – all things he loves! it is not easy to find fresh lemongrass, and to tell you the truth, when I find it is often overly dry. That little paste is simply awesome! It really is Sally! So convenient! Scott grew lemongrass in his new garden this summer and it took off! But then you only have it for a short period of time.